Mount Fuji(富士山, Fujisan) is the highest mountain in Japan. It straddles just west of Tokyo, from where it can be seen on a clear day. Mount Fuji's exceptionally symmetrical cone is a well-known symbol of Japan and is frequently depicted in art and photographs, as well as visited by sightseers and climbers. 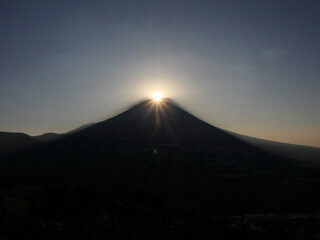 Mount Fuji's posture is also used as the symbol for this website. The summit has been thought of sacred since ancient times and was forbidden to women until the Meiji Era. The most popular period for people to hike up Mt. Fuji is from July 1 to August 27, while huts and other facilities are operating. Buses to the fifth station start running on July 1. Use Chuo Express Way to Kawaguchiko. Exit at Kawaguchiko. Use JR Chuo Line to Otsuki. Change FujiQ Line to Fujisan Station.